Imagine the best piece of pizza you have ever eaten. The crust has just the right texture, the sauce is delicious and flavorful, and it is topped to perfection with all your favorites. Yum. 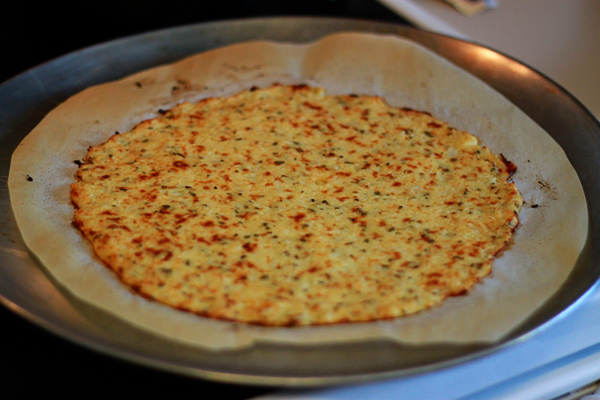 I can’t claim that this recipe rivals that thought I just conjured up in your heads, but when your tummy calls for the goodness that is pizza, but your mind knows it’s not the right time for a cheat meal, this cauliflower crust is sure to hit that pizza-loving spot. I’ve searched high and low for an alternative pizza crust to replace that weekly pizza night at my house. I’ve tried coconut flour, almond flour, and gluten free varieties (which is actually not a good direction to go as most gluten free flours have many more carbs than a traditional pizza crust even), none of which have left me feeling satisfied and always left me searching for the recipe I would try next. 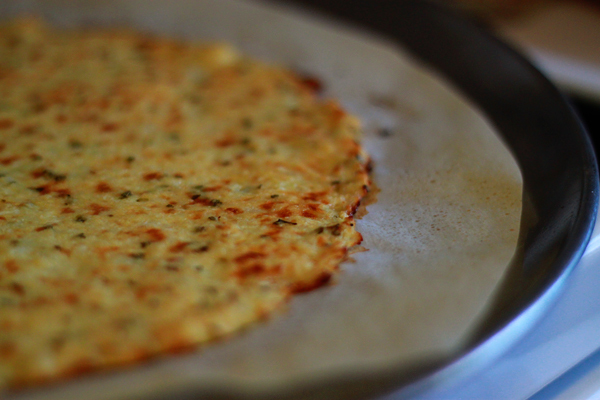 Finally, this cauliflower crust was found and I can guarantee that while my ‘perfect grain-free pizza crust quest’ may not be quite complete, this crust really hit the spot and has left me completely satisfied for the time being. Flavorful crust with good texture? Check. Able to be topped with delicious, homemade tomato sauce? Check. Goes great with all my favorite toppings? Check. This one gets an A+ in my book. The steps to make the crust are fairly simple. First, shred your head of cauliflower with a grater. You can also use a food processor for this step, just make sure that the cauliflower is shredded and not pureed. Once all the cauliflower is shredded, place into a microwave-safe bowl and microwave for about 8 minutes until cauliflower is soft. No water is needed for the cauliflower to steam in the microwave. Allow cauliflower to cool. Preheat the oven to 450° and prepare a baking sheet or pizza pan for the crust. Lightly spray with cooking spray. Mix your cauliflower crumbles (about 1.5 cups because it shrinks after steaming) with the egg, cheese, and spices. 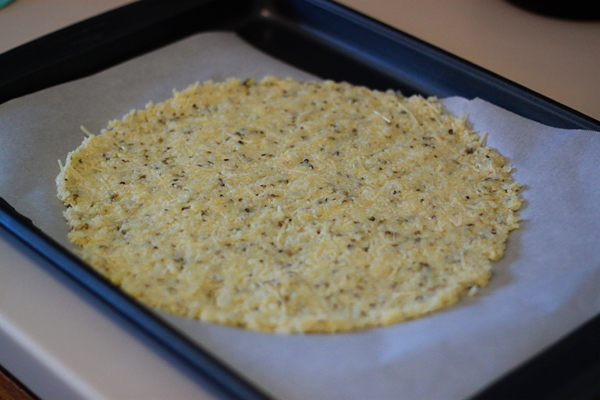 When the mixture is thoroughly combined, pour onto baking sheet and “pat” into a round crust. Lightly spray crust with cooking spray. Place crust in oven for about 15 minutes until golden and edges have become crispy. Remove from oven and top with sauce and your favorite toppings. Turn oven to broil and bake until cheese is melted and bubbly, about 5 minutes. We made two pizzas, one with homemade tomato sauce, mozzarella cheese, turkey pepperoni, and pineapple. 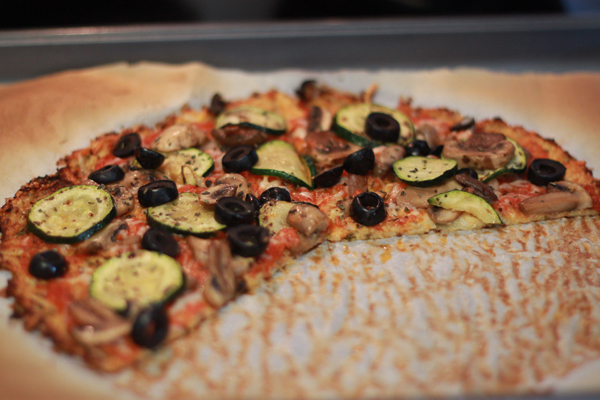 For the other, we skipped the cheese and used homemade tomato sauce, zucchini, mushrooms, and black olives. For this crust, we also attempted to lean more towards Paleo by using parmesan cheese (lower milk content) and reducing the amount of cheese to a ½ cup. We replaced the omitted cheese with just a bit more cauliflower. It turned out great and tasted exactly like the other crust. 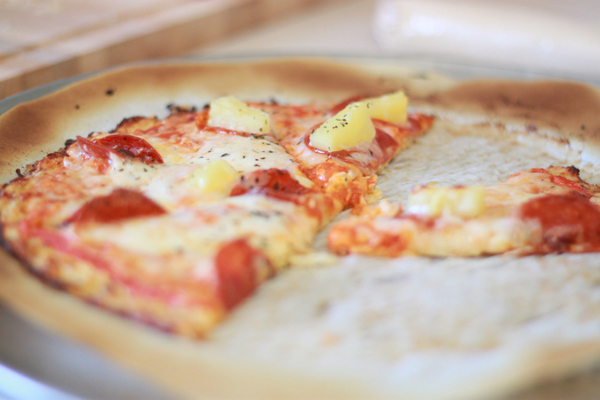 I really hope you guys like this recipe and that it hits that pizza-loving spot we all have! Let us know what you guys think! Recipe found at RecipeGirl and modified by us! Copyright © 2019 Powered by barbells, sweat and a great community.